Sam Alexander, Eva Alexander and Kaelynn are cutting flowers and decorating a wall in their garage. The wall is revealed to be a shrine of Nova helmets meant to remember fallen members of the Nova Corps! After they are done, Sam puts on his Nova helmet and begins to fly off. His mother asks him where he is going and finds that her son is going to see Jinin. Eva is concerned Sam will become involved with an alien. The teenager tells her not to worry since Jinin told him she hates him. Eva Alexander is even more worried because she thinks that means the alien girl likes her son! Later in space, Nova is preparing to open a stargate to Knowhere when he notices an explosion on the Moon. Arriving at the home of the Watcher, the young hero enters to find debris spread over the floor. As he turns a corner, Sam Alexander finds the dead body of the Watcher! Nova panics and immediately flies back to Earth to get help from the Avengers. He flies in too fast and smashes into the Avengers statue. As he picks himself up, he notices an explosion in a nearby building. At the explosion site, Spider-Man and Daredevil are fighting the Mindless Ones. As one of the rock-like monsters attacks from above, Sam flies in and knocks it across the street and accidentally into the Thing! After he pulls Ben Grimm from underneath the monster, Nova zooms back into action. Sam joins Thor in attacking the villainess named Exterminatrix. However, before he can get into the fight, the teenager is ambushed by a Mindless One! 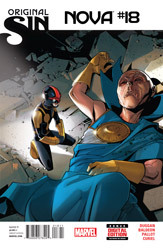 Nova dodges an energy blast and answers with a powerful punch only to find that it didn't knock his attacker out. The mindless monster unleashes another energy blast which Sam barely avoids. The two engage in a fast and furious fight with Sam Alexander finishing it by knocking the Mindless One out of the window. Unfortunately, the monster falls a number of floors to the street below and lands on the unlucky Thing! Sam rejoins the fight against Exterminatrix. Before Nova can even move, Captain America, Daredevil and Spider-Man launch an attack! Sam Alexander finds himself overwhelmed and stands by as Thor angrily hammers the evil woman into the ground. As Iron Man arrests her, Nova asks Exterminatrix why they killed the Watcher. In response, the super-villain known as the Orb appears and he's holding the Watcher's eye! The eye explodes and unleashes cosmic energy at all of the heroes. The optical energy contains all of the secrets the Watcher has seen over his vast lifetime. The secrets appear to be specific to the person the energy radiates. In Sam's case, he has a vision of the past. 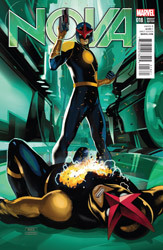 On an alien world, a member of the Nova Corps is being attacked by another Corpsman. After pulling an energy weapon and evaporating the Nova, the killer takes off his helmet. He is Sam's father, Jesse Alexander! Jesse is joined by a Black Nova named Adomox. The alien says he wanted the Nova soldier's body in order to send a message. Sam's father explains that dead is a message. Adomox questions whether Jesse is a friend of Rocket Raccoon. since he's so squeamish. The flashback ends and Sam is devastated by what he's seen. Iron Man tries to reassure Nova that he will be able to get through his crisis and wishes him luck. Sam takes off the Nova helmet and sits quietly in the street.